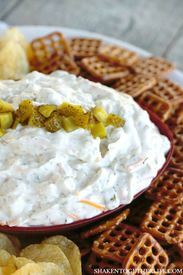 Packed with zesty dill pickles, garlic, dill and sharp cheddar cheese, this Creamy Cheesy Dill Pickle Dip from Shaken Together is a crowd pleaser! Don’t be fooled by its classic chip dip appearance. There is BIG pickle flavor packed into that bow, with an entire cup of diced dill pickles just waiting under that creamy dill and garlic flavored dip.